Golden Gai is an architectural wonder tucked away in a corner of the giant centre of commerce and entertainment that is Shinjuku. The twentieth century wasn’t an era that was kind to Tokyo’s architectural heritage – most buildings that didn’t fall down in the great earthquake of 1923, or burn down during wartime air raids, became a victim of Japan’s ‘economic miracle’ of the second half of the century, when almost the whole city was redeveloped in concrete. Golden Gai doesn’t contain any grand buildings or monuments, but is simply a tiny fragment of old Tokyo that has miraculously survived, albeit hemmed in and dwarfed by high rise developments all around. It allows a glimpse of what the city was like in the recent past – a unique record of a way of life that has nearly been bulldozed off the map. Golden Gai consists of six tiny alleys – much too narrow to get even a small car down – lined by almost two hundred tiny bars – more than you would find in the whole of most UK cities. 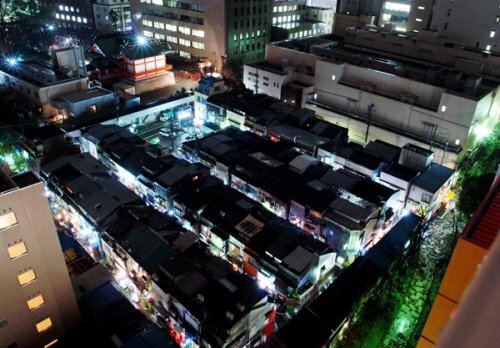 The buildings are ramshackle, and the alleys dimly lit – but bear in mind that Tokyo has one of the lowest crime rates of any big city, so the whole area is much safer than appearances suggest. Each building is only a few feet wide, and built almost touching the one next door. Many have a steep set of stairs leading to a separate establishment, or a tiny flat, upstairs. The bars advertise themselves with an eclectic mix of artwork and enigmatic logos – ranging from cats and acoustic guitars to painted lips and nudes – adding to their mystique, and making the passer-by wonder what’s to be found inside. Each bar caters to a slightly different clientele, and many only serve regulars – who should originally be introduced by an existing customer. Some establishments are so small that only five or six customers can fit in at one time – and that’s only if they don’t mind literally rubbing shoulders with one another. 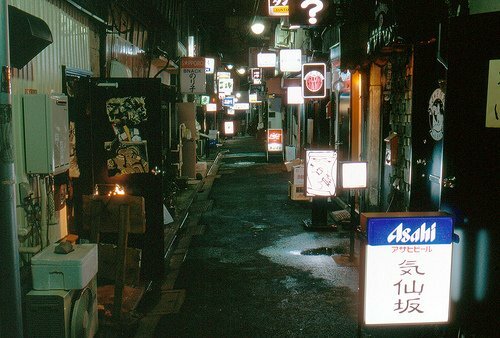 But this is all part of the appeal of Golden Gai – it’s regarded as one of the warmest and friendliest places to socialise and meet people in the whole of Tokyo. It’s easy to tell which bars are open to new customers – they’re the ones that display menus and lists of prices outside, some even having signs in English to attract visitors from overseas. While superficially Golden Gai appears to be one of the scruffiest and most run-down parts of Tokyo, the clientele it attracts tend to be anything but. Probably due to the modernity and pristine cleanliness of most of the rest of Japan, Golden Gai acts as a magnet for celebrities and arty types. While tourists from abroad are unlikely to recognize any of them, well-known personalities are often to be found hanging out here, and prices in many of the bars reflect this. At one corner of the area there is a tiny theatre that puts on mainly comedy shows in its miniature auditorium. Photos of past performances are posted on the side wall outside – and many famous actors, directors, musicians and other notables can be spotted there. 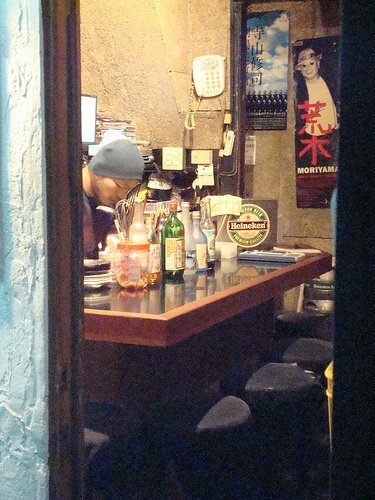 Golden Gai is a fascinating area to explore at any time of day – but it only really comes alive late at night, as most of the bars aren’t even open before 9 or 10p.m. If you’re in Shinjuku a bit earlier, and fancy a snack with your drinks, then you might be better heading to Shomben Yokocho right by the west entrance to Shinjuku station (and also known by its literal English translation, ‘Piss Alley’). Here is a collection of even more ramshackle huts with a similar atmosphere – but this time selling traditional Japanese food along with the drinks. The speciality is Yakitori – barbecued chicken – best enjoyed along with a beer or two. Access: Golden Gai is a short walk from the east exit of Shinjuku Station, between the Shinjuku City Office and the Hanazono Shrine.